Among the controversies swirling around Sen. Marco Rubio is a charge that while serving as speaker of the Florida House of Representatives, he used the state Republican Party's credit card to pay for personal expenses. But in an interview with Fox News anchor Bret Baier Monday, Rubio took pains to emphasize that he did not bill personal expenses to the state party but instead paid the bill himself, though he admitted the way he handled it was a "mistake." "I did not bill personal expenses to the Republican Party of Florida. The Republican Party of Florida never paid my personal expenses. Never. But look, you know, I shouldn't have done it that way. 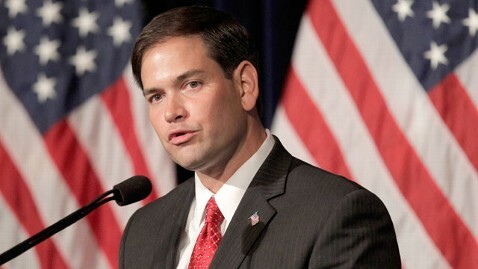 It was a lesson learned," Rubio said in Monday's interview. "It was a mistake. If I had to do it over again, I'd do it very differently." "At the end of every month, we would get those statements. We would see what was on there that was party related, and the party would pay that. If it wasn't party related, I would pay that directly to American Express. Now, obviously, in hindsight, it looks bad, right? I mean, why are you using a party credit card at all? Well, some of these expenses were because a travel agent had the … credit card number, and they billed it to that card instead of the other card. Sometimes, it was just a mistake, you know, literally just reached for the wrong card." Rubio, who sits atop many vice presidential dream team lists, came clean about the credit card matter during his 2010 run for the U.S. Senate, and his revisiting it now, along with the other controversies that surround him, could be an effort to head off any VP vetting Mitt Romney's campaign might undertake. "I guess it's because I'm new to Washington. … Maybe it's acceptable here - it isn't to me - to turn your back on friends when they're going through a difficult time, no matter … what they may have done or not done. And so in his case, he's a friend, and I'm going to give him the benefit of the doubt," Rubio said. "There was a disagreement with the bank about how much the monthly payments were. And it all got confusing. The bank turned it over to one of these law firms in Florida that specialized in quick foreclosure proceedings. And before we could figure it all out with them, they filed this paperwork. So we quickly addressed it, and we've never had a problem since," Rubio said. Asked if he was not making payments, Rubio said, "Yes, there was a disagreement over the amount per month. And so to them, that's not - those are not complete payments. And … so there were all kinds of other things that happened as a result of that. But that all got worked out as soon as we found out about it." Rubio will host a fundraiser for Rivera in Washington, D.C., later in May.